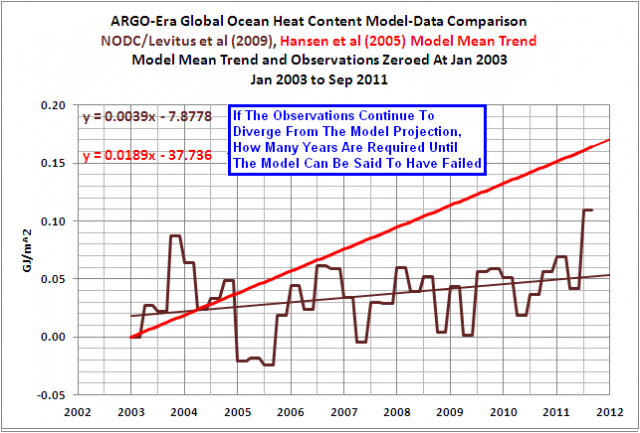 Upper Ocean Heat Content Change By Bob Tisdale | Climate Science: Roger Pielke Sr.
1. The latest analyzed heat anomaly is the highest in the period of record since the Argo Network obtained robust global coverage. 2. The current heat anomaly is still well below that predicted by the GISS model. Katsman, C. A., and G. J. van Oldenborgh (2011), Correction to “Tracing the upper ocean’s ‘missing heat,’” Geophys. Res. Lett., 38, L20602, doi:10.1029/2011GL049834. 4. In order to return to being in close agreement with the GISS results and the ensemble mean of the Katsman and van Oldenborgh study, there must be a significant heating in the comming several years.